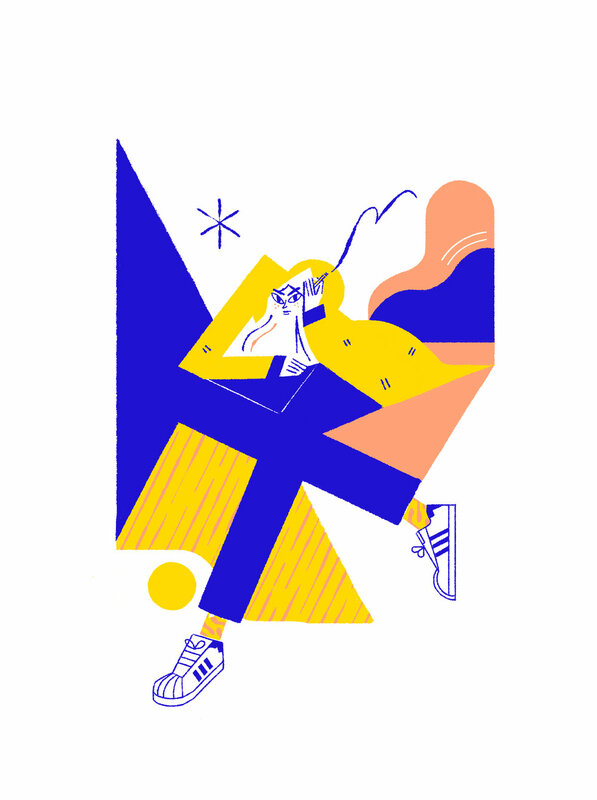 Carlos Alegría describes his work as "simple shapes, bold colors, and fun characters," and he his fast becoming one of my favorite animator-illustrators. Alegría works out of Spain, freelancing on motion graphics projects for clients including Royal Bank of Canada, Enigma Films, and the London School of Economics. His animations show off his love for minimalist design, and the classic works of his influences like Paul Rand and Saul Bass. Notice how deftly Alegría is able to move between both aesthetic and kinetic style, playing with cel-style animation, tweened puppets, and everything in-between. Check out his full portfolio here. You describe yourself as a motion-graphics animator and illustrator. What do you see as the key similarities and differences between motion-graphics and illustration? I think animation brings something magical to illustrations. It has many possibilities: you can add a new layer of storytelling, give life to your characters, or simply make an illustration mesmerizing. Right now I’m not sure if I could build a career as a traditional illustrator; I still struggle a bit about mediums and personal style. So the animation, kind of balanced that for me and give me more confidence. I enjoy it a lot. I think the “illustration for motion” is becoming something more personal, as it happens with the traditional illustration, where you can have your own style. Tell us about your training. Did you learn illustration and animation separately, or was your education integrated? If you could do it all again, do you think this is the best way to learn? I have not studied either illustration or animation. I have a degree in Graphic Design, and getting into motion design was something unplanned for me, but it came naturally somehow. Same thing goes for illustration, but my illustration work depends on the motion work, because I rarely get hired to make traditional illustrations, like for editorial and so. The best way to learn it? Focusing on what you really want to do, and practice a lot. I’ve worked as a designer for advertising, even as web and UI designer for a while. Also I would love to give it a try to a children’s book some day. So you have to make choices, and finding what you really want to do is also part of the process. Your portfolio is split into animated videos and GIFs. Do you approach long and short projects differently? What is your process like? Not really, I would say the different approach comes when is about commercial or personal work. The animated videos are mostly commercial work, so that means they come as a result of different things: the brief, the client needs, budget, time, art direction… So the workflow process must be very organized. When I do personal work, I like to play around and go a bit chaotic. I love the feeling of starting something without really knowing how is it gonna look like, and animation can also be surprisingly improvised. I love the World Cup piece you recently posted on your Instagram, and it’s clear from the Russian Suprematism inspired styling that you are a huge fan of design. Why choose that particular movement? Are there other moments in design history that inspire you? In the design field, I love the work of Paul Rand, Bass, Gerd Arntz… designers who somehow merged masterfully graphic design and illustration. Continuing with inspiration, are there any modern illustrators or animators that you admire or are influenced by? Sure, I like motion designers with a bold and personal style: Allen Laseter, Sebastian Curi, Xoana Herrera… And illustrators like Virginie Morgand, Adam Lucas… So many! Also the smart work of Pablo Amargo, who is originally from my home town. Do you have any advice for young illustrators or animators? What do you think is important to the future of these fields? Make work that you care about, be consistent, and have fun! Also, invest your time in making personal projects. Thanks to Carlos Alegría for taking the time to talk about illustration. Please check out his portfolio here: alegriamotion.com and follow him on Instagram @alegriamotion.